Seriously? OMG! WTF?Beverly Hills 90210 / Melrose Place Archives - Seriously? OMG! WTF? Before Luke Perry went to high school with the undead in Buffy the Vampire Slayer, his HS was full of a different type of undead in Twisted Sister’s Be Chrool to Your Scuel. The 18-year-old truly stands out while sitting down in that 1985 music video. In 1992, women fell in love with Dylan McKay on Beverly Hills, 90210 and men wanted to be him. His was like a reincarnation of James Dean, effortlessly cool. From that moment on, he never stopped acting. He did several disaster movies like Scorcher, Supernova and Final Storm along with some Westerns. His biggest movie, Buffy the Vampire Slayer, will forever be adored by teens. He could never get away from being that person that teenagers would admire. His last role is on The CW’s Riverdale. This time the eternal teenager played the dad of one. Something he knew oh too well because he has two kids of his own. Today, let’s honor the man that we either wanted to be or be with by watching one of his many roles. He will forever be that suave guy that stood out in a crowd. You can watch a few of his movies and 90210 on TubiTV for free. Luke Perry is hospitalized after reportedly suffering a major stroke. According to TMZ, paramedics rushed to his Sherman Oaks home yesterday morning, and we do not know how he is doing today. The 52-year-old is currently starring as Archie’s dad on The CW’s Riverdale. I am not sure if the drama has wrapped production for the season. If it has not, then how will that affect the show. 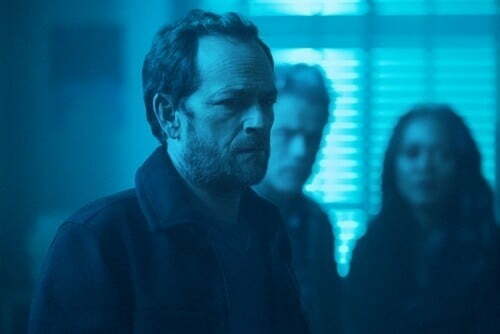 None of that matters, as long as Dylan McKay is OK. On that note, because of his Riverdale schedule, he was not expected to be a major part of the Beverly Hills, 90210 reboot on Fox this summer. Although, he is supposed to be on it. Hopefully, he can still be part of it. UPDATE: TMZ is reporting that Perry is sedated. Sources also told them that he was responsive and talking when paramedics got to his house, but his condition deteriorated on his way to the hospital. Is it really a Beverly Hills, 90210 reboot without Shannen Doherty? Fox announced today that 6 original members of Beverly Hills, 90210 are sort of revising their roles for 6 episodes this summer. This could either go really well or really badly. Thinking about it, the latter would be so much better. Which could be why Shannen Doherty and Luke Perry are not part of it. If they want to make really good, then they should get Douglas Emerson to be part of it. Who is he? He played Scott Scanlon, David’s friend who committed suicide during the first season. He can be begging to be part of the show and they are like your character is dead. Gabrielle Carteris is the president of the Screen Actors Guild and she is trying to get commercials to join the union. What better way to do it, then to stage a reunion with her Beverly Hills, 90210 co-stars Tori Spelling, Jennie Garth, Jason Priestley, Brian Austin Green and Ian Ziering. Maybe they can tell the ad agencies they will do a commercial together, only if they join SAG. I would buy whatever they are selling. Wouldn’t you?